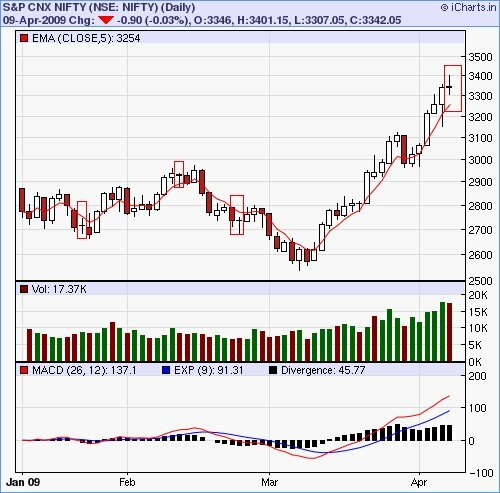 Nifty Daily Charts chart shows that whenever Doji's are formed in nifty its good to apply the 5 EMA rule to nifty daily charts. act as a gravitational field in my previous post What could be the reason for Consolidation in Nifty? 1)Either monday Nifty should directly test the 3254 levels to meet 5 EMA line even if nifty opens gap up….. So how a trade could be intiated at this level on monday? shows that trend reversal could happen any time soon. So a gap up opening in nifty is a good oppurtunity to shorters this monday for a target of 3300 and 3250. Also RSI-2(96.26) and CCI-4(185.6) indicate heavily overbought levels.